Blossom Pin Pro is the premium version of Blossom Pin. This easy-to-use WordPress theme comes with all the remarkable features of the free Blossom Pin and other cool added options like advanced typography, advanced advertisement placements, multiple unique layouts, performance settings, and tonnes of theme customization features which will help you create a unique and stunning website with just a few clicks. Schema ready for added SEO benefits, WooCommerce compatibility for creating an online store, and clean code for impressive web performance are some added perks you will enjoy with Blossom Pin Pro. Lifestyle Blog – Create a go-to blog for lifestyle hacks and tips. Fashion Blog – Know how to look stunning? Let the globe know about your fashion tricks. Travel Blog – If you love traveling, you should start a travel blog to pay for your trips. Beauty Blog – Got some mad makeup and beauty skills? Why not share them? Mom Blog – Write about the wonderful experience of becoming a mom and make some extra bucks. Food Blog – Create a delicious food blog for all the food lovers. You want to create a WordPress blog just like Pinterest! You want to create a blog that seamlessly integrates with your favorite social media. You want a WordPress theme that’s intuitive and easy-to-use. You are looking for a Schema ready blog theme for extra SEO benefits. You want to create a top-class grid layout blog, but hiring developer will break your bank. Your client wants an easily customizable and easy-to-use WordPress template. You can choose from 6 different header layouts in Blossom Pin Pro. Make your website unique with attractive layouts. Blossom Pin Pro offers 18 intuitive design layout for your homepage. You can display full-width homepage or homepage with left or right sidebar. You can also choose from the grid layout, the list layout, or the masonry layout. Blossom Pin Pro features 8 slider layouts. You can display your banner slider in 8 different ways– single slide at a time, masonry layout with multiple slides at a time, single slide with a glimpse of two other slides, or the grid of slides. Whether you like full-width posts or posts with sidebar, full-width featured image but sidebar on the content area, the title of the post on the image or below the image, Blossom Pin Pro has got you covered with 6 different single posts page layouts. With Blossom Pin Pro, you can display 4 different types of pagination. You can use Next/Previous, Numbered (1,2,3,..), Load More button, or Auto Infinite Scroll pagination style. Like Pinterest and Instagram, the Blossom Pin Pro also allows you to add a post with only images or videos. You also have the option to display Gallery, Audio, and Quotes as post beside the standard post format. In-built color options let you quickly make Blossom Pin Pro suit your brand color. Make your website with the colors you like. The number of people that browse the Internet from their smartphones has increased exponentially. In fact, more than 50% of the Google searches are done on mobile phones. So, you will be able to target every kind of audience with this fully responsive WordPress theme. Blossom Pin Pro will automatically adjust itself to any screen sizes so that your blog always looks beautiful. Blossom Pin Pro WordPress theme passes Google mobile-friendly test which will help you rank in the search engines as well. However, you don’t have to worry about that with Blossom Pin Pro WordPress theme because you can make your website load crazy fast with just a few clicks. Blossom Pin Pro was developed using fonts that are easy on the eye. However, if you don’t like the default fonts, you can quickly change them from the live customizer. Blossom Pin Pro has an Instagram section that will help you grow your influence with your Instagram posts! You can easily integrate your Instagram account to your blog. Who doesn’t love social media? Blossom Pin Pro allows you to integrate your social media profiles on your blog quickly . Grow your influence on Instagram, SnapChat, Twitter, Facebook, and Pinterest by adding your profile links on your website. Blossom Pin Pro is fully compatible with BlossomThemes Email Newsletter plugin. You can easily add subscription form using the plugin. The theme’s newsletter section combined with the newsletter plugin will help you grow your email subscribers. Blossom Pin Pro theme is Schema ready so search engines will fall for your website. Blossom Pin Pro has an option that allows you to show the last updated date on the single post page. This feature will help you rank better in Google as Google prefers to rank recently updated posts. Blossom Pin Pro features infinite scroll pagination. With infinite scroll, visitors can see all your posts without reloading the page. Infinite scroll automatically loads posts while the user scrolls through your page. Blossom Pin Pro allows you to enable post likes button like that of Instagram. This helps visitors to show the love for your posts. The number of likes is also displayed when hovered over the like button. Blossom Pin Pro comes with an Advertisement widget so that you can easily place ads on the sidebars and make more money from your blog. This widget lets you add an ad code or a custom image with a link. You can show your latest posts or posts from your favorite category in the banner section of the homepage. You can show up to 20 recent posts or unlimited posts of a category on the slider. The above-the-fold slider will increase the user experience. Also, Also, you can control the transition, loop, caption, image, and animation of the slider so that your blog looks cool! Blossom Pin Pro allows you to add a video on the banner section. A video is a great way of engaging your audience on your website. 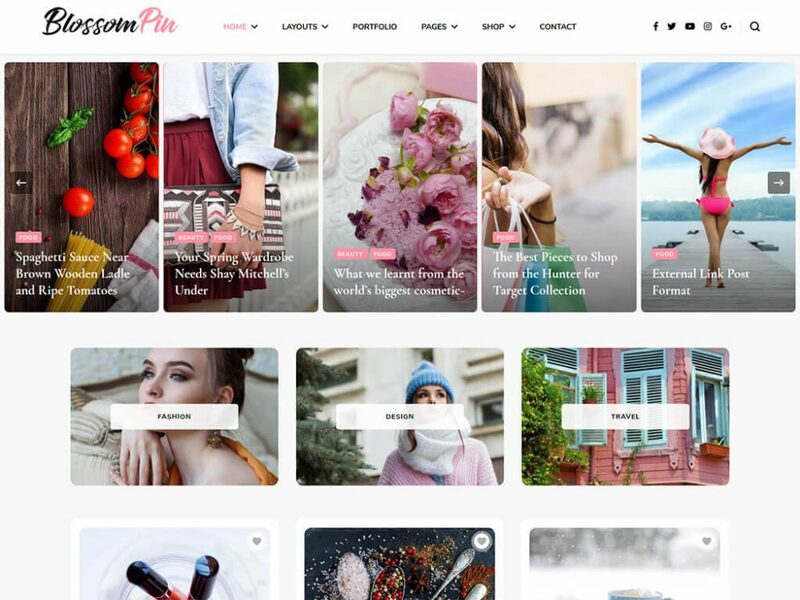 Blossom Pin Pro WordPress theme allows you to display your social media links on your website so that your visitors can find you on social media. Social media on your website will also help you boost your business’ engagement. The theme also supports Russian and Chinese social media like OK, VK, Zing, qq, and others. You can add unlimited social media on your website. Having a social share buttons on the post helps you grow your audience because you have a chance to get trending on social media. Blossom Pin Pro’s social share feature allows you to add Social Share buttons on the post page easily. With Blossom Pin Pro, you can make your main navigation menu sticky so that visitors can access it at all time. This feature makes your website interactive. You can display the posted day in number of weeks or a specific date on Blossom Pin Pro WordPress theme. Blossom Pin Pro WordPress theme comes with an extensive theme documentation to help you setup your website. Just follow the step by step guidelines on the documentation and your website will be ready in no time. Blossom Pin Pro theme is fully compatible with WooCommerce plugin. You can easily create an online shop to sell your own products once you scale your blog. More monetization option! Blossom Pin Pro has ample space for widgets. You can add and manage the widgets you require without compromising the design of the theme. Widget ready design and code allow you to customize your website as you desire easily. Blossom Pin Pro is cross-browser compatible, which means the theme will work seamlessly with the popular web browsers. The theme is tested on Chrome, Firefox, Internet Explorer, Edge, and Safari. With the perfect font type, size, spaces, and contrast, Blossom Pin Pro makes sure that your content is easy on the eye and your visitors enjoy reading what you have to say. Don’t let the language barrier come between you and your website. Blossom Pin Pro theme supports localization so that you can use the theme in your local language. Do you use right-to-left (RTL) scripts like Arabic? Well, worry not! Blossom Pin Pro supports both LTR and RTL languages. You can write content with confidence! You can easily add your own logo on your website using Blossom Pin Pro theme. Want to modify some CSS effects or the change color of a section? Blossom Pin Pro allows you to easily add CSS effects right from the customizer.